A visit to Rosemont Pavilion on Wednesday saw a lot of changes to Destination Irvine&apos;s "Innovation Rocks!" The volunteers at Phoenix Decorating Company were working hard to get fresh materials on the float before the judges stopped by for the first of three rounds of judging. Mums in yellow, gold, red, white, rust, lavender and Kermit green were being placed and roses in red and lavender were in vials in boxes or pressed into the foam layer. Lyn Lofthouse, Floral Director at Phoenix, spoke about the art of choosing the right flowers for the right place. "There will be mums on the gears in various areas, but too much will lose the gear look," she said. "I&apos;m always looking for what&apos;s the best material for each individual prop and where it is on the float." 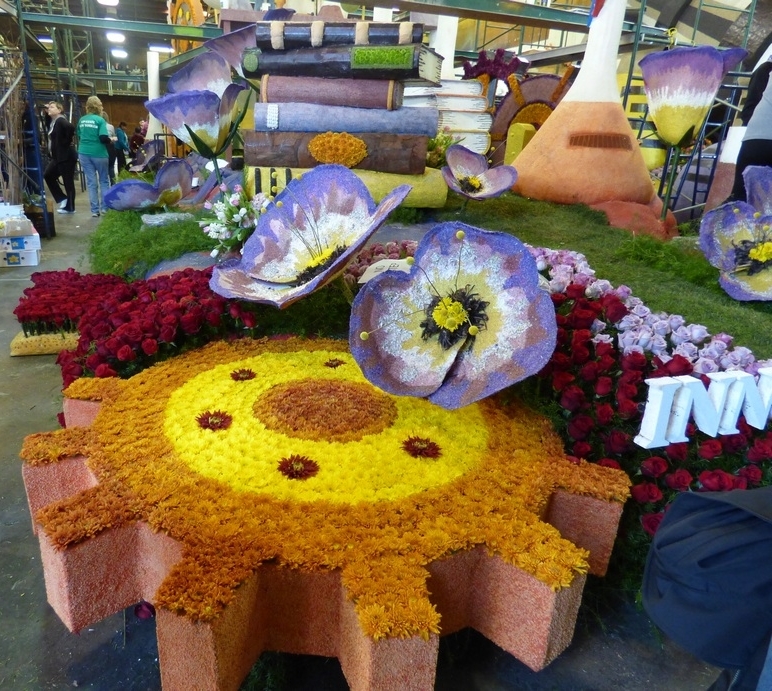 The fanciful giant sculpted flowers, though mostly covered with statice in purple, gold and lavender and white everlasting, have centers of yellow gerbera surrounded by hyacinth root with yellow Billy buttons shooting out like stamen, "for fun," Lofthouse said. The taller flower s use delphinium in shades of blue and purple. Red and yellow flowers, including roses, cover the deck of "Innovation Rocks!" along with green plants such as cordyline, ferns and Spanish moss. Fresh sod, a material that may seem unusual is glued onto the deck in rectangles. Tulips in white and pink, hyacinth, hydrangea and heliconia, anthurium in white, pink and red, and pink gladiolas complete the floral touches. 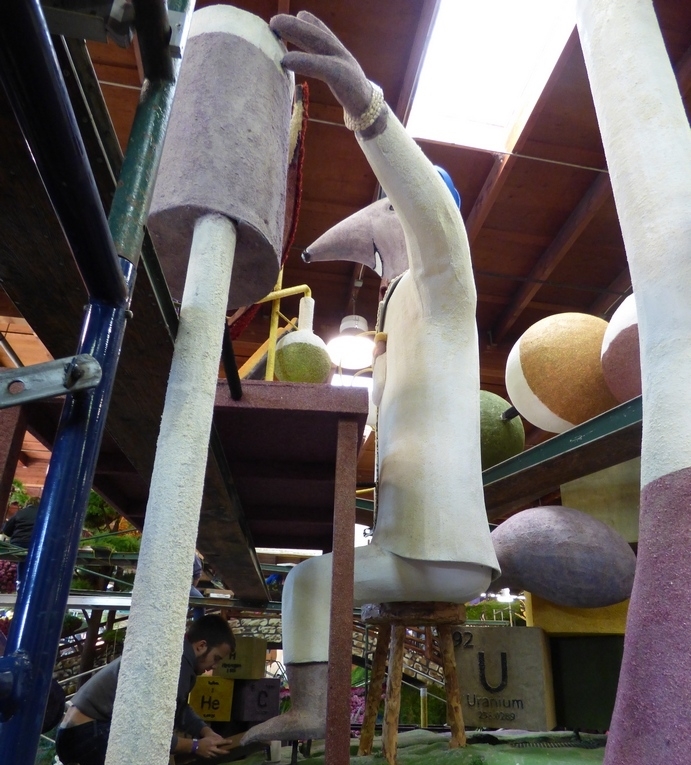 With all the color on the rest of the float, a shortage of blue statice changed the plans for Peter the Anteater. The big guy has changed his color from blue to gray, which really is more anteater-like anyway. Volunteers from Kiwanis youth clubs-Key Club for high schoolers and Circle K for collegians-earn service hours and money for their clubs by decorating Rose Parade floats. The decorating process is directed by crew chief Dave. 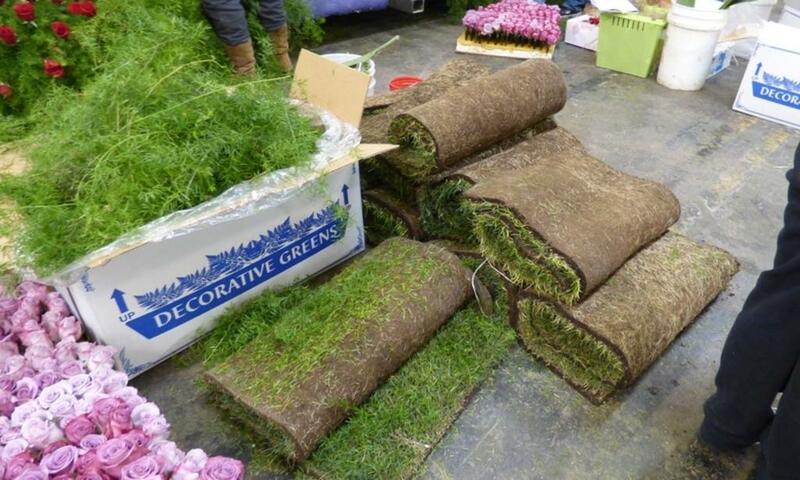 For the lowdown on the dry decorations, read "Bringing ‘Innovation Rocks!&apos; to Life with Statice and Strawflower."